When it comes to anti-acne and blackhead skincare, I’m basically looking for industrial strength, so when I saw Perfect Image Gel Peel - which is not a bunch of fancy stuff in a bottle, it’s mostly professional level 20% salicylic acid balanced with soothing and antioxidant essentials (green tea, tea tree, chamomile and cucumber) - I said, yes please. Also, I’m a sucker for anything with a dropper. This isn’t a case of a brand making a “faux” professional product. 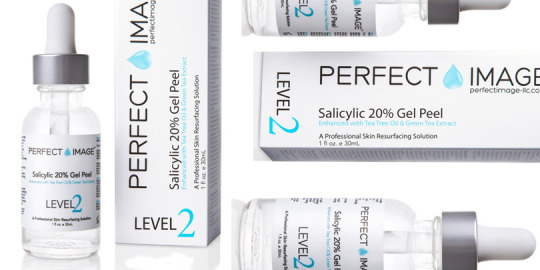 Perfect Image mostly makes skincare peels, from Level 1-2, which they sell to the public, to Level 3, which they sell only to licensed professionals. They don’t sell Level 4 - that’s for MDs and usually requires anesthetic. So back to Level 1 and 2 - these are professionally formulated peels that you can do at home, specifically designed to help all forms of breakouts, eliminate blackheads, whiteheads and help clarify the skin. Apply before you shower or wash your face, leave it on for a minute or so, and rinse it away. Apply a moisturizer afterwards (not an acne-fighter) … and a day or so later, new skin is revealed and acne starts to clear. This is especially good for problem areas like your jawline. It also helps fade recent marks and uneven skintone from healing acne. LIke a lot of other things we’ve reviewed lately, this is a great way to do some of those “splurge” rituals at home, and really see results. There are tons more in the offering, and all are thoughtfully explained - but you can also buy a sample pack here.